Betelgeuse is the ninth brightest star in the sky, and the second brightest in the constellation of Orion (it’s the red one, on the opposite side of the Belt from Rigel, which is the blue one, and the brightest). With a mass of some 20 sols (= the mass of 20 Suns), Betelgeuse is evolving rapidly, even though it’s only a few million years old. It’s now a red supergiant, burning helium in a shell, and (very likely) burning carbon in another shell (closer to the nucleus), and (possibly) oxygen, silicon, and sulfur in other nested shells (like Russian dolls). Betelgeuse is enormous … if it were where the Sun is, all four inner planets would be inside it! 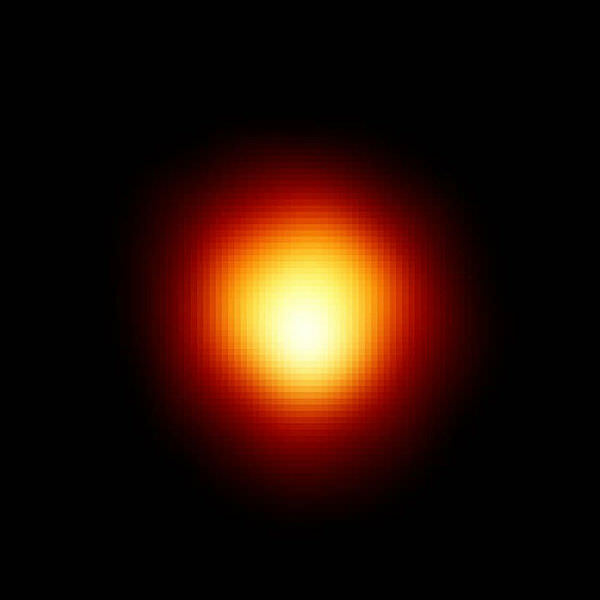 Because it’s so big, and is only approx 640 light-years away, Betelgeuse appears to about 1/20 of an arcsecond in size; this made it an ideal target for optical interferometry. And so it was that in 1920 Michelson and Pease used the 100″ Mt Wilson telescope, with a 20 m interferometer attached to the front, to measure Betelgeuse’s diameter. The Hubble Space Telescope imaged Betelgeuse directly, in 1995, in the ultraviolet (see above). Why the UV? Because ground-based telescopes can’t make such observations, and because the Hubble’s resolution is greatest in the UV. Since the 1920s Betelgeuse has been observed, from the ground, by many different optical interferometers, at many wavelengths. Its diameter varies somewhat, as does its brightness (Herschel is perhaps the first astronomer to describe its variability, in 1836). It also has ‘hotspots’, which are ginormous. Betelgeuse is also shedding mass in giant plumes that stretch to over six times its diameter. Although these plumes will certainly cause it to ‘slim down’, they won’t be enough to stop its core turning to iron (when the silicon there is exhausted, if it hasn’t already done so). Not long afterwards, perhaps within the next thousand years or so, Betelgeuse will go supernova … making it the brightest and most spectacular supernova visible from Earth in perhaps a million years. Fortunately, because we are not looking directly down on its pole, when Betelgeuse does go bang, we won’t be fried by a gamma ray burst (GRB) which may occur (while a core collapse supernova can cause one kind of GRB, it is not yet known if all such supernovae produce GRBs; in any case, such a GRB is one of a pair of jets which rip through the poles of the dying star). AAVSO has an excellent article on Betelgeuse, and COAST’s (Cambridge Optical Aperture Synthesis Telescope) webpage on its observations of Betelgeuse gives a good summary of one interferometric technique (and some great images too!). Universe Today has many stories on just about every aspect of Betelgeuse, from its varying size (The Curious Case of the Shrinking Star), the bubbles it’s blowing and its plumes (Closest Ever Look at Betelgeuse Reveals its Fiery Secret), featured in What’s Up This Week, to the bow shock it creates in the interstellar medium (The Bow Shock of Betelgeuse Revealed). Astronomy Cast’s The Life of Other Stars is a whole episode on the evolution of stars other than the Sun.